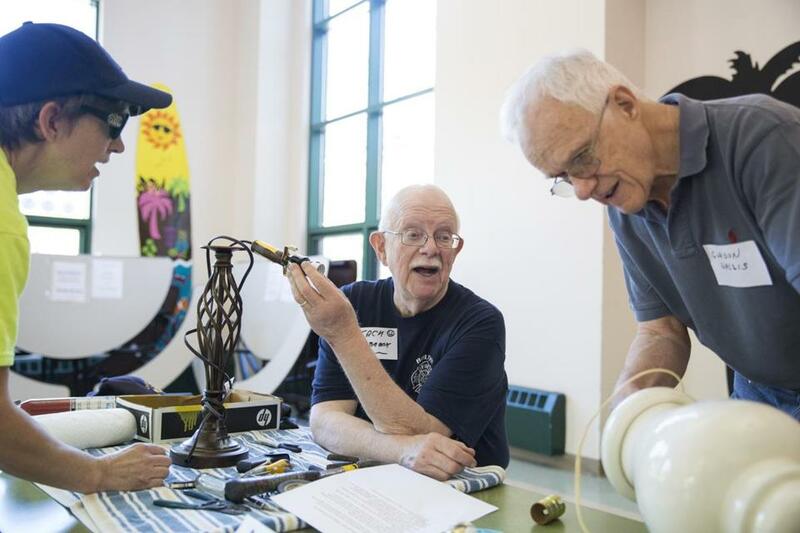 Jackie Gillis, Jack Holbrook, and Gordon Wallis use their fix-it skills to repair lamps at the Repair Cafe in Bolton. Inside the cafeteria at the Florence Sawyer School in Bolton, Pam Cole checks the presser foot on her Bernina sewing machine and places a box filled with spools of thread, a bag of metal zippers, and a pink plush pincushion within arm’s reach. In an hour, the guests will begin trickling in. But now, Cole, 53, takes a breath, relaxing for a moment on this Saturday morning, just past eight o’clock, while other volunteers scurry across the room, placing signs on tables that say small appliances, electrical, computers, miscellaneous, and sewing; carrying tool boxes from their cars; or making coffee to serve with homemade sweet breads and cider doughnuts from a local farmstand. This is the Repair Cafe, started in 2013 by town resident Ray Pfau, sponsored by the Rotary Club of Nashoba Valley with support from Bolton Local, and gathering steam as more and more area residents hear about it. Outside, Pfau, 70, a former Peace Corps volunteer who recently retired from high tech, hurries to post the last sign near the road. Even though the event is free, it takes a nudge to get people’s attention. “As far as publicizing goes, we send out press releases to the local papers and to the senior centers,” Pfau says, ticking off a list that includes the regional school district, the e-mail distribution lists for about a half-dozen community and service groups, and area libraries and businesses. The Repair Cafe is an international movement. It began in the Netherlands in 2009 and now boasts 1,000 cafes worldwide — all of them dedicated to reducing waste, repairing and recycling usable items, and passing on repair skills threatened with obsolescence in a world that daily becomes more disposable. “We want people not to be afraid, to let them know you can try, you can figure it out, you’re not helpless,” says volunteer Teresa Sauer, a 48-year-old Bolton farmer who is ready to troubleshoot whatever challenge comes her way. The Bolton Repair Cafe is powered by roughly 40 volunteers, and while attendance varies, sometimes there’s a one-to-one match between volunteers and guests. In January, says Pfau, 45 area residents carried in 75 different items, including knives, scissors, and other tools in need of sharpening. Today, 19 volunteers have agreed to tackle everything from broken toasters and coffee pots to missing buttons, torn pants, finicky laptops, and other items that are part of daily life. Bob Johnson is a retired electrical engineer who sits at a table behind a sign that says “small appliances.” Rich Dischler, 56, an electrical engineer and computer architect, occupies a table marked “computers.” And Jack Holbrook, a retired firefighter, is on call at “electrical,” the station that always fills up quickly. The people bringing their broken things, referred to as “guests” rather than customers, are required to register at the door. They fill out a form, take a numbered slip, and wait their turn, helping themselves to coffee and doughnuts if they’re so inclined. Interestingly, the most frequent repair requests are for lamps. A couple at the registration table hold matching pole lamps; a man, carrying out a repaired lamp, minus the shade and bulb, digs into his pocket for some cash, a donation, to cover the cost of a switch replaced on his daughter’s favorite lamp. No one — and almost nothing — is turned away. Today, at the table marked “small appliances,” two repairmen and a guest are huddled around a stationary exercise bicycle the guest has lugged in. Nearby, Laurie and Charles Gio, a middle-aged couple from Clinton, have brought in Laurie’s mother’s wheelchair, which has a stuck brake. And Lancaster resident Marie Espinola, 85, has hitched a ride with a friend, bringing a lamp, a flashlight, a cordless vacuum cleaner, a paring knife, and several other things that need fixing. Cafe rules dictate that if you bring something in, you must wait while it’s being fixed, and there’s a strong push to get people to learn how to make repairs themselves. You can stuff a dollar or two into a collection can on the refreshments table if you want. But it’s not expected. And the volunteers are as thrilled as their guests when a repair succeeds. 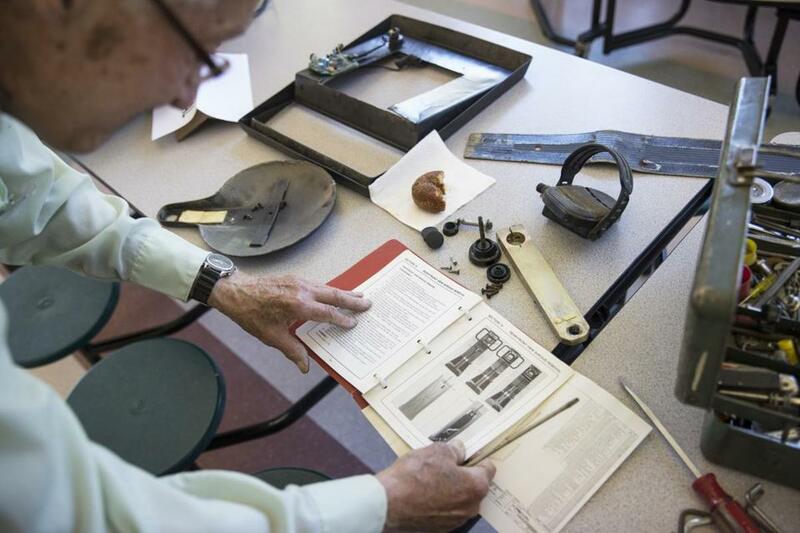 Bob Mong reads through an instructional manual while working on a repair.